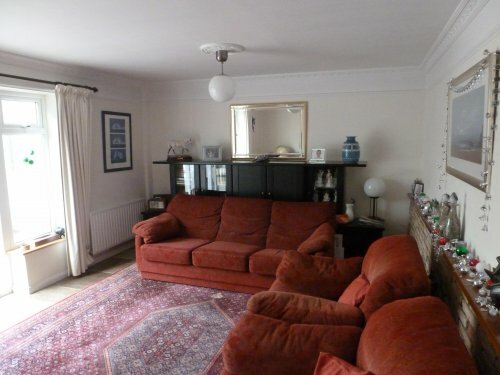 A 1950's, brick built, 3 bedroom semi-detached house. 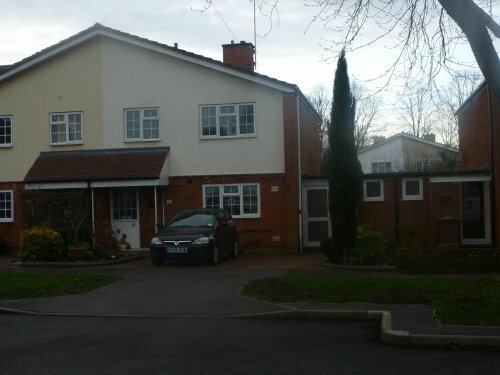 Featuring a spacious lounge and conservatory, fully equipped kitchen, newly fitted bathroom (2012), and landscaped gardens. This home is perfect for a couple, or small family seeking a safe, quiet and friendly, traditional English neighbourhood. 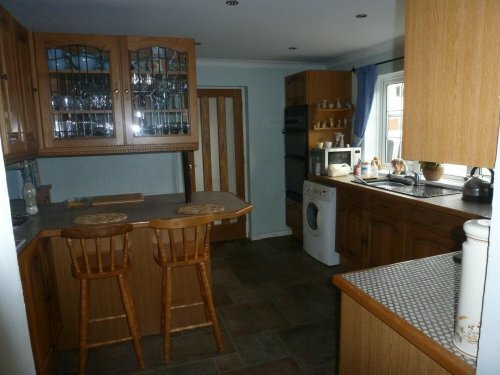 Ground Floor: The kitchen is located at the front of the house. It is very well equipped. If you love cooking, everything you require is there. A double oven, (Gas) and a four ring hob. In addition, there is a microwave, bread maker, food mixer/blender, fridge, freezer and various cooking appliances. A cosy breakfast bar completes this fully functional kitchen. A spacious lounge, housing a 50" plasma TV, complete with DVD and Denon music system is at your disposal. The lounge has large French windows leading you into the conservatory, creating a light and spacious living area. Combined, the lounge and conservatory provide the ideal place for entertaining guests for dinner, or simply relaxing over a glass of wine with your partner. 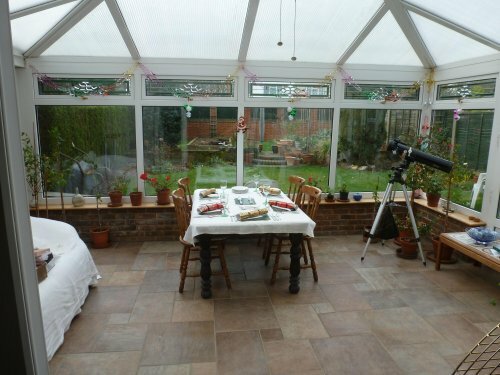 The entire house, including the conservatory, is heated by a newly installed central heating system. 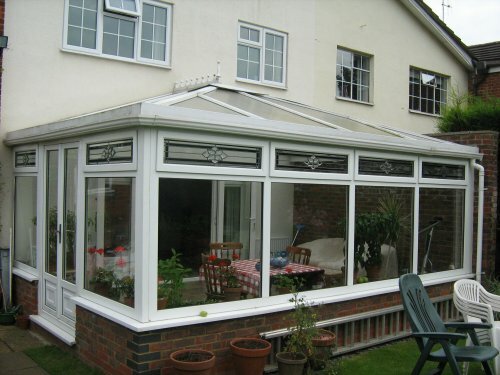 The entire house has double glazed windows which is ideal during those colder winter months. The ground floor also has a toilet/wash room facility. 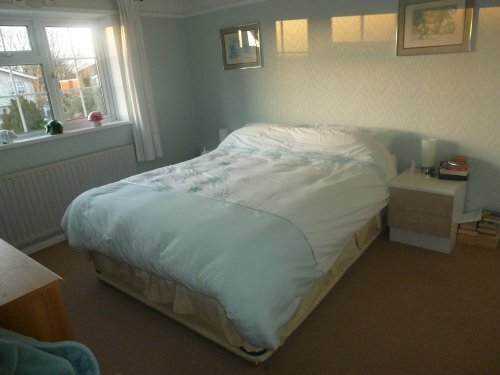 First Floor: Two double bedrooms, each with King size beds and storage facilities. 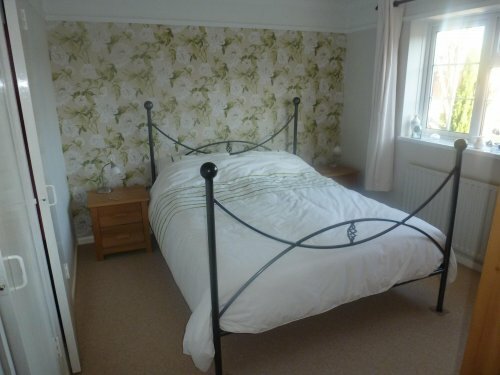 The third bedroom offers a single bed. 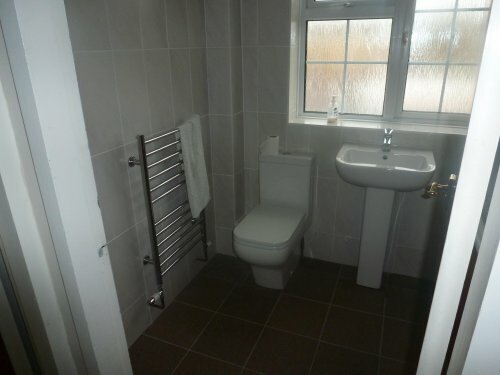 The family bathroom has been recently re-fitted to a contemporary design, complete with bath and shower. A very well kept terrace garden, including a vegetable patch, provides the ideal quiet location to unwind and relax in the summer months. A fully equipped gas B-B-Q, capable of catering for small or large family get-togethers is free to use. 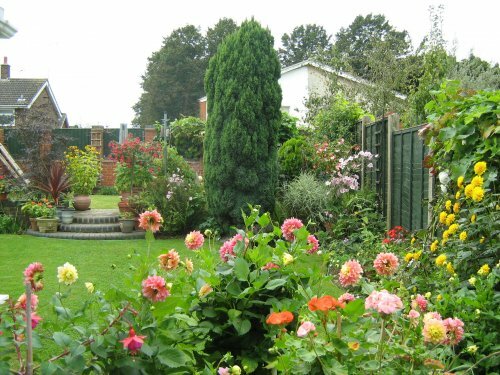 We enjoy our garden very much and hope you will also. A PC, with high-speed broadband connection with internet access and Skype is available. The landline telephone allows users free access to all UK landlines, plus 5 European countries and Australian telephone numbers. The house is a 10 minute walk to the town centre, (Stevenage) and a further 2 minutes to the main line rail station to London and the North (Cambridge - Scotland). 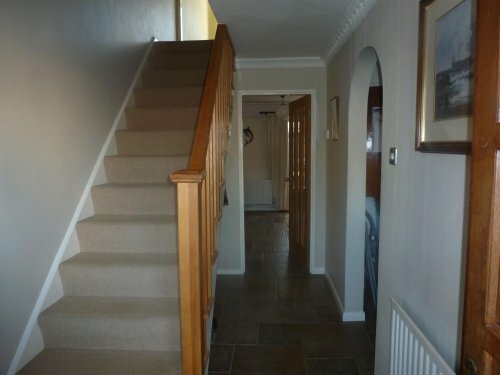 Situated in a very quiet Cul-De-Sac, our home is a 10 minute walk to the town centre. There are 2 large national supermarkets within a 5 minute walk away. There are many restaurants, bars and pubs, catering for all tastes and cuisines situated within a few minutes walk, or no more than a 15 minute car drive away. Local amenities and attractions include a public swimming pool, 12 screen cinema, 10 pin bowling, sports leisure centre, theatre, numerous parks and walks. 20 minutes away is one of the largest M&S stores and John Lewis department stores in the U.K. The infrastructure is ideal for all travel destinations, with access to the A1M (north/south) motorway only 3 minutes away. Luton and Stanstead airport, (30 mins) and London airports (Heathrow, 45 mins) cater for all international flights. By rail, a 23 minute train journey will take you to the heart of all that London has to offer, including the Olympic Games. A cheap day return rail ticket to London, including unlimited bus and tube/metro passes is GBP20 pounds, or AUD30.00, or USD30.00. There is private parking for 2 cars at the front of the house. Our car is available for a reciprocal exchange, fully insured. Local tourist attractions includes, Knebworth House, Hatfield House, home of Elizabeth I, R.H.S. Gardens at Wisley, Whipsnade Zoo, Woburne Safari Park, Imperial War Museum, R.A.F. Duxford and Dunstable Downs (Gliding). Hi, we are Maurice and Joan. We are both retired and enjoy life to its full. Healthy, fun loving and non smokers. Maurice is a high performance marine engineer and Joan a catering supervisor. We have 2 children and 2 grand children. Our son lives in the same town as us and is only 10 minutes away, should you require any assistance from him. Our daughter lives in the Eastern suburbs of Sydney with her husband and 3 year old son. We have been to visit them on a number of occasions and we now feel the time is right for another visit. We hope to arrange an exchange in the Eastern suburbs for a minimum of one month, but we are open to all offers. We welcome all serious offers to exchange and we whole heartedly assure potential exchangers that we'd treat and respect your home as if it were ours. We look forward to receiving all responses and best wishes to all.